A positive attitude is so important in today’s world. Having a positive attitude means focusing on the good things in life and not dwelling on the negative. This helps people cope with daily stresses and reduces destructive thinking. However, children aren’t born with a positive attitude; it is something that is developed. As parents and caregivers in Oak Creek, we can help children develop positive attitudes about life that will help them as they face the challenges associated with growing up. What can parents and caregivers do to help their children develop a positive attitude? Teach internal dialogue control. These are the things that we say to ourselves inside our heads. Children need to learn that when they start thinking negatively about themselves or situations, they can stop and think of something positive about themselves or their situation. Instead of saying, “I’m stupid, because I can’t understand the math,” teach your child to find the solution. “Just because I need extra help, it doesn’t mean I’m stupid. Being positive is a choice. When you are mad or unhappy, you have chosen to react that way. People and situations can make us feel badly but we choose whether or not to dwell on it and allow it to change our mood. Find reasons to smile and laugh. Tell jokes, watch funny movies, tell stories. Smiling and laughing actually change your brain chemistry and make you feel better. A home full of laughter is a happy home. 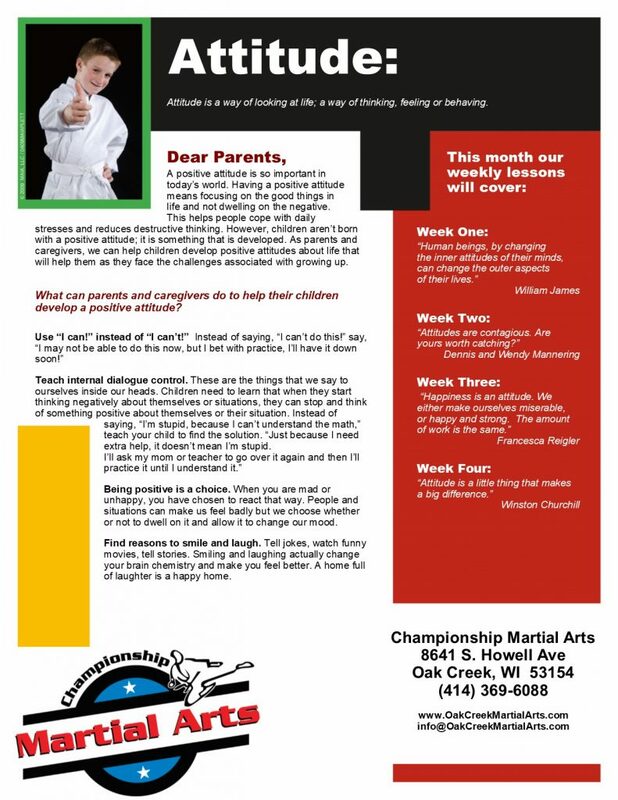 Interested in Kids Martial Arts or Kids TaeKwonDo in Oak Creek? Please visit our website for more information.